NOTE 2: John Badger will go to Downey at 145, Eddie Garcia will be at 152 instead. Monroy will go to LCC at 112, and Viallalobos will go to South Hills at 112. NOTE: This Wednesday, the VARSITY ONLY will have the day off. All other wrestlers will have practice from 3-4pm. The varsity did an *excellent* job at the Laguna Hills Invitational by placing second in the whole tournament! Good job guys! Quite a few young men medaled: Christian Hauser finished first, Shane Johnston third, Matt Grovom second, Russell Fitzpatrick first, Juan Hernandez second, and Victor Mendoza third. 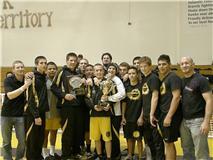 In addition, Russell was named the Most Outstanding Upper Weight Wrestler of the tournament. Great job Russell! Where to go from here? Though this week’s performance was encouraging, we still have things we need to improve upon, and the post-season is right around the corner. Let’s be sure we don’t rest on our laurels. In particular, Monday, Thursday, and Friday this week we will be working on our offense. Come ready with the right attitude to work on your weaknesses so you can peak at the right time. NOTE: wrestlers with a *by their name will travel with the team to Downey, but are NOT garaunteed entry. We are going to try to get you in but the tournament director cannot make any promises. For those wrestlers with a *by their name ONLY, if you do not get in you will be released early to be taken home by a parent if you wish. For all other wrestlers, you must stay the whole time…no leaving early. This goes for wrestlers at the other tournaments too…support your team!